I built up this old school Bandai 1/60 scale kit of Ingram Unit 3 from Mobile Police Patlabor for a friend. There were two goals for this build- first, to replace the gross rubber joint covers with sewn cloth parts, and second to keep the finish looking pretty clean, with a softer 80’s model kit finish. The covers were made with some help from my mom, and came out perfect. The paint job was a bit of a departure for me, but it was a fun experiment. In the Patlabor anime, Unit 3 is the reserve machine that’s mostly kept around for spare parts, so it does not see much action. That meant it should have a pretty clean finish, but I couldn’t help doing a little shading and dust buildup as if Unit 3 had been drafted into active duty during a particularly busy season. The support car got a little more road dust and rain streaking from everyday use. Here’s a shot of Unit 3 squaring off against the CMS Corp Economy Model Ingram. The scale is not quite right, but they still look great together. 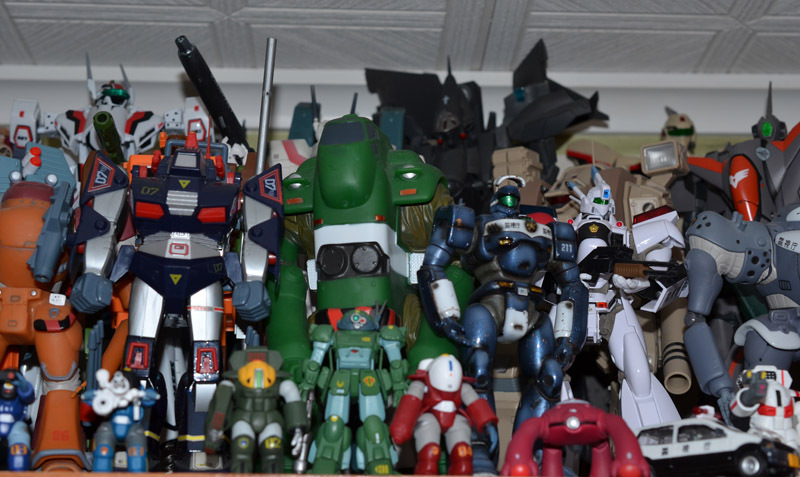 Check out lots more pics after the jump, showing off the rest of the accessories and more scale comparisons. Mobile Police Patlabor might be my favorite mecha anime. 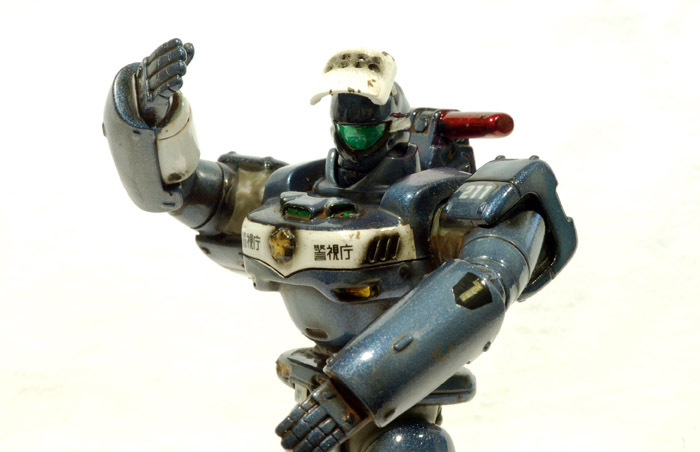 I am all about down and dirty war shows like VOTOMS or Gundam 08th MS Team, but the combination of more civilized real robot action and the fantastic characters make Patlabor a fantastic series. In Patlabor, mecha (labors) have become an everyday thing for everything from construction to war. As with all new technologies, labors are abused, so special police divisions are created to combat labor crime with their own Patrol Labors (‘Pat’ ‘labor’).